One of the many interesting ingredients in the Japanese pantry is konnyaku — a versatile, low calorie food with a highly distinctive texture. It’s rubbery and springier than even finger jello1. Also called “devil’s tongue jelly,” konnyaku is more or less flavorless until it is simmered in broth, and so it is almost always part of a dish that has a flavorful broth or dressing. Besides soaking up the flavors of the broth, it provides an interesting textural element to stews and soups — for example, in the vegetable stew recipe below, you get soft vegetable, soft vegetable, soft vegetable, some fairly soft tofu, and then springy, resilient konnyaku. The calorie label is a bit hard to believe: a 9 ounce (255 gram) package has only 30 calories, just 0.12 calories per gram, compared with a carbohydrate’s 4 calories per gram or a fat’s 9 calories per gram. The reason for this is fiber: the magic of konnyaku is that it form a resilient mass of fiber with nearly no starch, fat or protein. 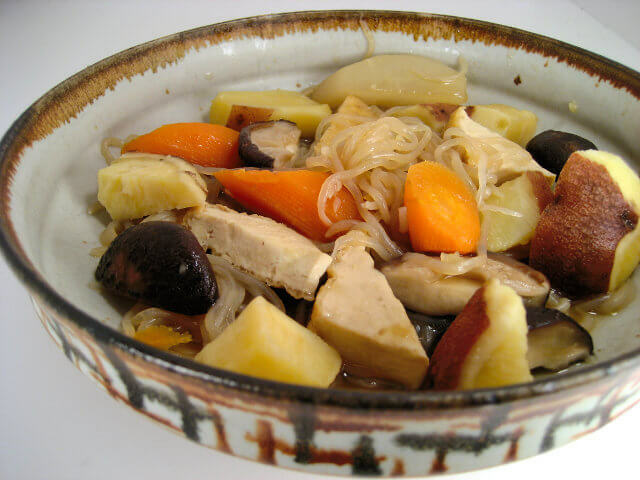 Konnyaku frequently appears in winter stews — the most famous one being oden — as it provides a dramatic contrast to ingredients which are soft from a long simmer. Oden appears in many kinds of restaurants and food stores: there are specialist restaurants with decades-old broth (see video below for details), but you’ll also find it in convenience stores in Japan (7-11, Lawson’s, Family Mart, etc.). When I visited Japan in past years, something about the stew captured my attention, and I have tried many times to make a vegetarian oden at home. After many failures, I finally figured it out, thanks to Elizabeth Andoh’s invaluable Washoku. 2. 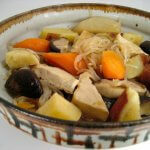 The combination of ingredients and cooking method create a stew that transports me back to Japan. One of the beauties of the stew is that you can adjust ingredients as you see fit. No lotus root or burdock root? Leave them out and add some more potato or mushrooms 3. I haven’t tried green vegetables like snow peas or green beans, but it is conceivable that they would be tasty too. My adaptation of Andoh’s recipe is below. But first, a video interlude. Update, 1/13/19: In each episode of the Trails to Tsukiji program on the NHK World network (which I receive via old-school antenna), a reporter investigates an ingredient, starting at the world-famous Tsukiji market, and working in both directions: ‘upstream’ to its source (farm or sea) and ‘downstream’ to restaurants using the ingredient in traditional and modern ways. Next, she heads to Gunma prefecture to see how the yam that is turned into konnyaku is grown, and to learn an old fashioned way to make konnyaku from a yam farmer. The growing process is relatively complicated, since each yam takes two years to grow — a season in the field, overwintering in a slightly-heated warehouse, and then back into the field for another year before final harvest. The most surprising part of the episode was segment at the Konnyaku Theme Park (!) in the Kanra district of Gunma. It’s primarily a place to promote traditional and new uses of the ingredient, with a free buffet of konnyaku-based foods, viewing ports into a working factory, cooking lessons for kids, and more. Konnyaku Park will definitely be on my ‘to visit’ list when I next visit Japan. 1 block konnyaku about 12 oz. 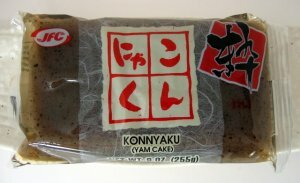 When you open a package of konnyaku, you will probably notice a somewhat funky aroma. Do not worry, this is not a sign of spoilage (assuming the konnyaku is opened before its sell-by date). Rinse the block with clean water. To make triangles, first slice it in half lengthwise. Tip each piece onto its flat end and slice through the middle to make two thin sheets (you'll have four pieces now). Next, use the tip of your knife to make shallow cuts into the surface of the konnyaku to provide additional surface area for flavor absorption. After scoring both sides, cut the pieces in half lengthwise, and then into triangles. Do not stack pieces on top of each other as you cut, as they might slip as the knife applies pressure. The first step -- and quite a fun one -- is to dry roast the konnyaku in a pan to remove excess moisture and thus allow it to absorb the flavors of the stock. Heat a large skillet or wok over high heat. When it is hot, add the konnyaku to the dry pan. Do not worry, it will not stick. Shake the pan to loosen the pieces and turn them now and then. When the konnyaku starts to squeak, add the oil. Stir fry the konnyaku for an additional 30 seconds, then add the vegetables. Stir fry for a few more minutes. Add the tofu and pour in the dashi (stock), soy sauce, sugar and sake. Stir the mixture. Reduce the heat to medium-low. Cook, covered, until the vegetables are tender. Serve with some rice, a salad, some Japanese quick pickles, and a nice saké. Variation: You can also use shiritake, a noodle-like product made out of konnyaku. To prepare it, rinse it thoroughly after opening the package, cut the threads into shorter pieces if desired, then follow the same dry roasting process as for the konnyaku block. Note: the roll cut is used to create uneven shapes that have extra surface area for flavor absorption or to reduce the chance of sticky during stir-frying. However, it also makes for vegetables that can be tough to pick up using chopsticks. A critical building block of vegetarian Japanese cooking, this stock is full of naturally-occurring flavor enhancers from kombu seaweed and shiitake mushrooms. Ideally, the seaweed and mushrooms will soak for many hours, but that isn't essential. A decent stock can be made in a hurry. 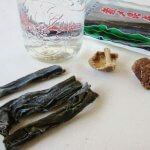 Place a piece of kombu sea vegetable and several dried shiitake mushrooms into the water. For best results, use a glass or ceramic container. Let this mixture steep for a few hours or overnight in the refrigerator. A long soaking allows the natural glutamates (flavor enhancers) to develop and dissolve into the water. When ready to make the stock, put the mixture in a pan over medium heat. Bring it almost to a boil, then reduce the heat slightly to keep it at a low simmer. Keep it at this point for 5 minutes, then turn off the heat. Let the mixture steep for 5 minutes more, and then strain into a saucepan. Save the shiitake mushrooms for another use (recipes that call for dashi also often use shiitake mushrooms). The kombu is often discarded, though there are certainly recipes that use it (Washoku has a one for a kombu relish). Originally published May 15, 2007. Updated to fix broken links, reformat recipe, and describe the Trails to Tsukiji video. Finger jello was not an uncommon offering at parties and potlucks in my youth in Michigan. I think it’s been several decades since I have seen it. If you want to learn how to cook Japanese home-style food, buy the book. The konnyaku and other oden ingredients are simmered in a broth that has been simmering for decades. Like a sourdough starter, the restaurant staff adds additional water, kombu, bonito flakes, and other ingredients every day. In my post about the San Francisco’s Boudin bakery, I mention a oden restaurant in Osaka that has been has been continuously cooking their oden since 1897(!). Whole Foods recently had shirataki noodles on sale for- as I recall- 0.99 a bag. Nice blog. I used to eat konyaku all the time when I lived in Kyoto. I seem to recall (could be completely wrong here) that gluten is used as the binder. Thank you very much for explaining where shirataki comes from. I’ve always wondered how it was possible for the noodle to be almost zero calories compared to many other noodles made from wheat and other grains. I’ve typically found the noodles’ texture unique but the lack of flavor stopped me from truly enjoying it. I’m intrigued by the stew and the broth to flavor it. Do you find the dashi stock makes a big difference in infusing flavor in the shirataki noodles? I agree with you about the shirataki noodles: I used them in a spicy peanut noodle recipe from Serious Eats and was underwhelmed. They had no flavor and didn’t really absorb any of the dressing’s flavor. I am skeptical that the noodles (or the konnyaku blocks) actually absorb any flavors — they seem too non-porous (there’s a good experiment for someone: weigh konnyaku blocks before and after simmering in stock). And so I don’t think that the dashi stock makes a difference in noodle flavor. But when it comes to the entire stew, the dashi is critical — it serves as the umami foundation to the stew. Apparently, the natural glutamates in kombu and shiitake mushrooms heighten your sense of taste.